Essay aus dem Jahr 2005 im Fachbereich BWL - Recht, Note: 1,7, Higher School of Economics Moscow, Russia, Sprache: Deutsch, Abstract: Legal and economical interpretations of contract, contract law and contract theory, asymmetric information, adverse selection and moral hazard. 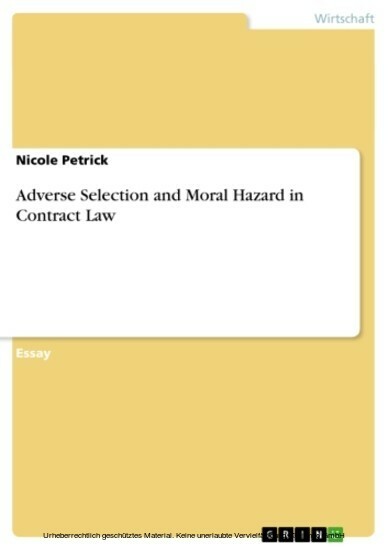 Paper explains negative effects of adverse selection and moral hazard for the case of transaction costs and incomplete contracts and describes incentives to avoid adverse selection and moral hazard, such as signaling and deductibles as well as indemnity contracts and valued contracts. Nicole Petrick-Felber hat Wirtschaftswissenschaften an der Humboldt-Universität zu Berlin, der Higher School of Economics Moskau und der ESCP Europe Paris studiert. Sie hat einen Abschluss als Master of Science in Economics and Management Sciences der Humboldt-Universität zu Berlin und arbeitet als Unternehmensberaterin.